Kay's Bar, Edinburgh © Travel Signposts..
With more pubs in Edinburgh than the number of days in a year, trying to find the best pub to go to during your Edinburgh holiday is an impossible task. Just along Edinburgh’s famous Royal Mile, there are pubs galore, some of which are very popular with tourists, like Deacon Brodies, whereas others are frequented more by locals. Of course there is no such thing as the “best pub” as people’s tastes are so different. For some, good ale is all that counts, for others the atmosphere is important and then again for others, it could be a combination of the two. Being in Scotland, pubs don’t just stake their reputation on good ales – a range of good whisky adds to their credentials as well. We were lucky to have a ‘local pub guide’ to take us to some nice, but quieter pubs during our day in Edinburgh. We hadn’t seen Alistair for almost five years since he left the Far East to return to his homeland. It was very nice of him to offer to travel down from Montrose to catch up with us, a journey that takes about two hours by train to Edinburgh. Tony had made arrangements to meet Alistair and Linda at 2:30 p.m. I was told that we were not going on a pub-crawl and that Alistair was going to show us some of the “hidden” sights of Edinburgh. However, when Alistair showed up at our hotel with Linda…. and his drinking partner James, I knew that we were headed for the pubs of Edinburgh. Oxford Bar – Our tour director suggested that we might like to go to the Oxford as this was the bar that Ian Rankin’s Rebus drinks at. Alistair was not keen. He said that the people who run the place are absolutely rude and they especially disliked tourists. So, we stuck our head into the pub just to have a peek and left. The next day, we heard from members in our group who had gone to the Oxford that Alistair was correct. Kay’s Bar – Our first stop was at this charming-looking pub in Jamaica Street. Being only a wee drinker, I tend to favour pubs with a nice atmosphere and I liked Kay’s a lot. This small pub has an intimate atmosphere and the bartender was very friendly. There is a small cozy reading room at the back in which I would have been happy to sit and read for hours. John Kay and Sons used to be wine merchants for over 150 years. From their 39 Jamaica Street premises, they supplied fine wines and spirits for the domestic and international markets. When that business closed in the seventies they began trading as a public house. 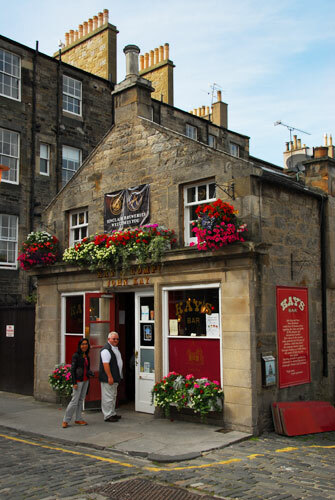 On the red notice on the side of the building the pub claims it is one of Edinburgh’s premier cask ale-house and declares that “Kay’s name is your Guarantee”. The guys certainly enjoyed their ales in this pub. 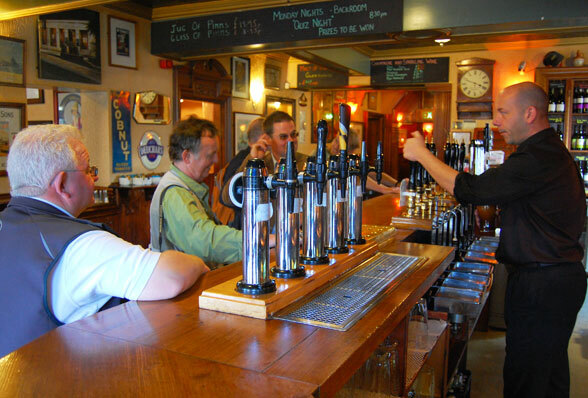 Kay’s Bar is a little hidden away and only those who like a good pint and pub will find their way here. I would have been happy to stay in this pub and not move along. Cumberland Bar at 1-3 Cumberland Street was our next stop. This pub has a good variety of beer. The bartender was nice but from an atmosphere point of view I liked Kay’s better. The Cumberland has a nice Beer Garden so in summertime it’s possible to enjoy your refreshing pint in the sun. 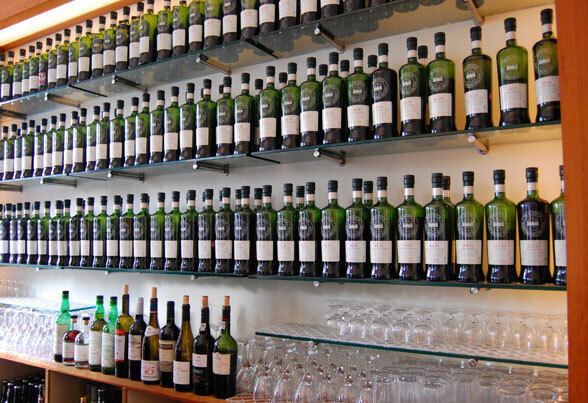 We then went to the Scotch Malt Whisky Society in Queen Street, a place for the serious lovers of single cask single malt whisky. The wall of whisky bottles at the bar all looked the same, except for a number on the label. An interesting concept at the Society is that they don’t mention the distillery on the bottles and a number rather than a name denotes each distillery. Each whisky is passed by the Society’s Tasting Panel and a tasting note is provided. The reason for not including the distillery’s name is that the curious nature of single cask, single malt whisky means the tastes are often not characteristic of the region it comes from. The whisky is not cheap here, each bottle ranging from £60 – 80. What’s more, you need to join as a member before you can purchase their whisky, even from the online store. Well, Tony certainly enjoyed this whisky experience which, if not for Alistair, we would have missed. After the afternoon of alcohol, the next stop had to be food and we were brought to the Dusit, a Thai restaurant in Thistle Street which Alistair and James swear is the best Thai restaurant in Edinburgh. It must be good as these two Bangkok veterans had lunch there before meeting up with us. So we ended the day with a very tasty Thai meal with Singha beer.